@therealmrchoc: "#tbt Back in 2000 I was a little bit heavier (as you can see) and I used to work for Power 106. I was spinning at a industry party for Label heads and programmers. The label brought her over and introduced us. She thanked me for playing her music on the radio and we took this pic. She was really cool and down to earth! This was after the success of "One In A Million". What was surprising is that the label sent the pic to me and she signed it. She didn't have to do that but she did...that's how cool she was! I only met her this one time but I'll always remember it. Rest in Power Aaliyah you are truly missed!" Awww, this is really sweet, yet sad at the same time. 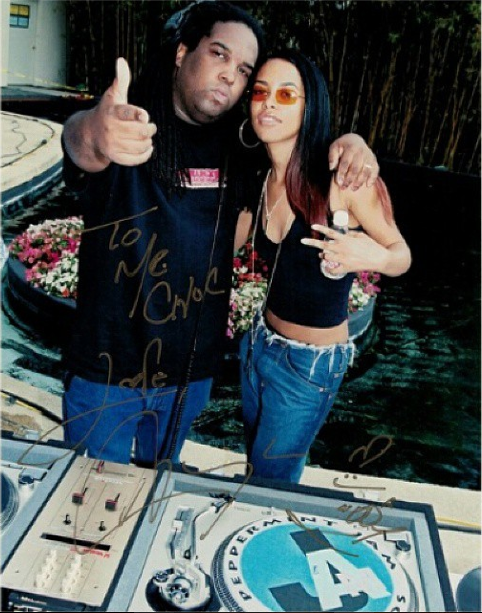 This truly shows how nice Aaliyah was no matter who she met, she took you into her heart 100%.